Katherine Sonderegger is currently Professor of Theology at Virginia Theological Seminary. 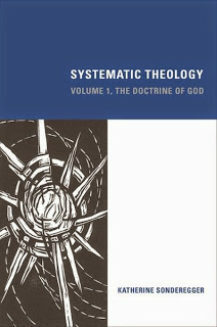 Her much awaited Systematic Theology Vol 1, The Doctrine of God has just been released by Fortress Press. Sonderegger is a theologian in the Reformed tradition which includes both Charles Hodge and Karl Barth, but there is no sense in which she is simply rewriting the greats. She has developed her own distinctive voice. This book is biblical theology: just that. We stand within the church, without hesitation or reserve. But this is not because the great church tradition finds its home in this theology as “source” of some parallel or lesser kind. Nor is it because we shun novelty…or pray that the sturdy walls of the church will withstand and repel all criticism… No! Rather the doctrine that follows in this volume seeks to listen to Holy Scripture, to feed on it, and from its riches, bring forth the Divine Perfections of the One God. This is not a naïve Biblicism – far from it. But Sonderegger’s book is filled with expositions of Scripture, read theologically. And from her reading of Holy Scripture, Sonderegger wants to recapture an emphasis that theology has somewhat eclipsed in the last fifty years or so: the oneness of God. The story of this eclipse goes back the Renaissance in Trinitarian thought sparked by the work of Karl Barth in the middle of last century. Barth started his doctrine of God with the Triunity of God – with the three, rather than the one (to put it crassly). Since then, theologians Catholic, Eastern Orthodox and Protestant have put the doctrine of the Trinity at the head of their theological reflections. We could list the names: Rahner, Zizioulas, Moltmann, Pannenberg, Gunton, Lacugna. All of them are famously theologians of the Holy Trinity. And at one level this was a necessary readjustment from a kind of philosophical Unitarianism that had come to dominate academic theology since the days of Friedrich Schleiermacher in the early 1800s. The theism of that theology was not distinctively Christian. The Trinity is Christian monotheism, after all. Nothing, we say, is so close to the heart of Scripture as is the Oneness of God. This is the theology of Deuteronomy, which is the hinge between Israel’s redemption and her subsequent history in the land (and out of the land). Yhwh is not only supremely God, and therefore to be worshipped above all gods, he alone is God. There is no other. …all other modes and manifestations, all other predicates, Attributes, and Perfections, all other disclosures of God as Word and Spirit are governed by and determined by Oneness, the surpassing Divine Uniqueness and Freedom. That is: everything else you might say about God stems from this Oneness. What about Christology? Surely Christian theology ought to begin in some way with Jesus Christ? Sonderegger will not dispute that, but she finds that much contemporary theology has begun with the human story of Jesus Christ, drawing attention to his human suffering, wishing to set before us the inspiring story of the life of Jesus Christ. A great sin for contemporary theologians is to be “abstract,” which has its antidote in the concrete reality of the human Jesus. I seek to honour Christ as God, just that: in His Divine Nature, invisible, humble, wise, the One God. In His Divine Nature, omnipresent, omnipotent, omniscient, the One God. In His Deity, Christ is Love, eternal, surpassing, glorious Love. It is by setting forth the Divine Perfections, by allowing ourselves to glimpse how Scripture tells us Quid sit Deus [What God is] that we recognize and bow down before the One God, incarnate. Christology is not primarily the business of speaking about a particular human person. It is about the relationship between divinity and humanity. It is the discussion of how two natures are connected in the one person. I think you should know about Katherine Sonderegger because she is a contemporary theologian writing a theology which seeks primarily to listen to the Holy Scriptures in a way that is actually prayerfully interested in the God of Holy Scripture. While she is not ignorant of the political and academic trends of our age, she is not driven by them. I am only beginning to read her work, but already she has challenged many of the assumptions I have been working with for years (having read much of the theology of the 1980s and 90s) and in exactly the right way: by asking what does the Bible actually say? Michael Jensen is the Rector of St Mark’s Anglican Church, Darling Point, in Sydney. He previously taught theology and church history at Moore College for 10 years, and completed his doctorate at Oxford University, which was published as Martyrdom and Identity: The Self on Trial. He has published a number of other books, including Sydney Anglicanism: An Apology, and My God, My God – Is it possible to believe anymore? He is currently working on projects on the doctrine of humanity and on Reformation Anglicanism. He maintains his interest in literary fiction, Eastern European history and culture, and J.S. Bach. Michael is married to Catherine and they have four children.